It is a surprise to most people that much of Whitstable beach is privately owned and that no right to walk on it currently exists. To rectify this anomalous situation and to preserve access to the beach in the future the WBC submitted a Public Right of Way beach footpath application to Kent County Council. We believe that as the beach is maintained out of the public purse that the public should have access to it as a right, rather than relying on the goodwill (or whim) of the landowner. As you may have noticed, signs have recently appeared on the beach groynes forbidding access to the beach below the low water mark so access to the beach is a genuine concern. The route applied for extends from the Sportsman Public House at Seasalter to the Harbour. Historic maps show a footpath along this stretch. The WBC submitted the application to Kent County Council in 2004 and ten years later, in 2014, KCC finally considered the application and unfortunately declined to make a footpath order (7/8/14). We are naturally disappointed that it was a recommendation to decline to make an order for the entire length of the claimed footpath but since the application was made by Nick Dewhirst on behalf of the Whitstable Beach Campaign ten years ago, the Marine & Coastal Access Act of 2009 has been enacted. The Marine & Coastal Access Act came into force in 2010 and addresses many of the concerns the people of Whitstable have with regard to access to and the free use of the beach. For the first time people will have the right of access around all our open coast. This includes – where appropriate – any land, other than the trail itself, which forms part of the coastal margin and which has public rights of access along the way. This is known as ‘spreading room’. 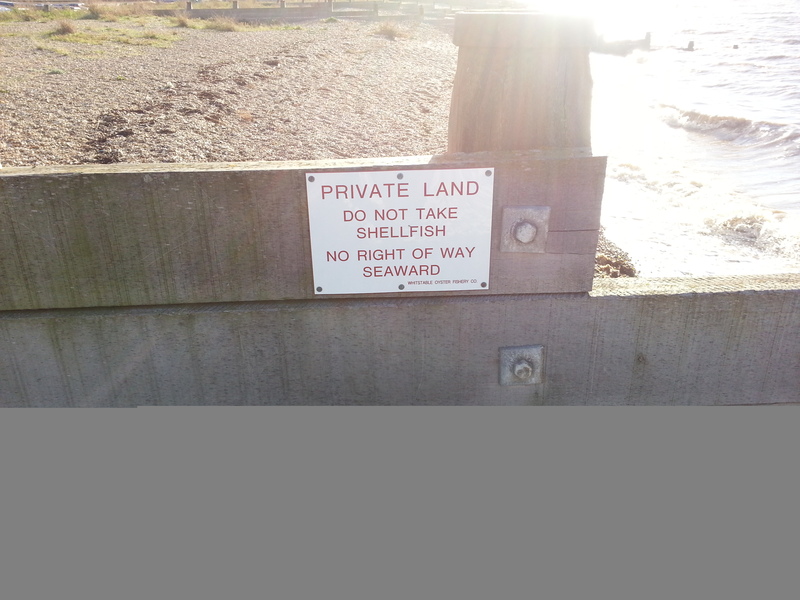 Although the Act does not safeguard Whitstable beach from private development it does make access to it a legal right. 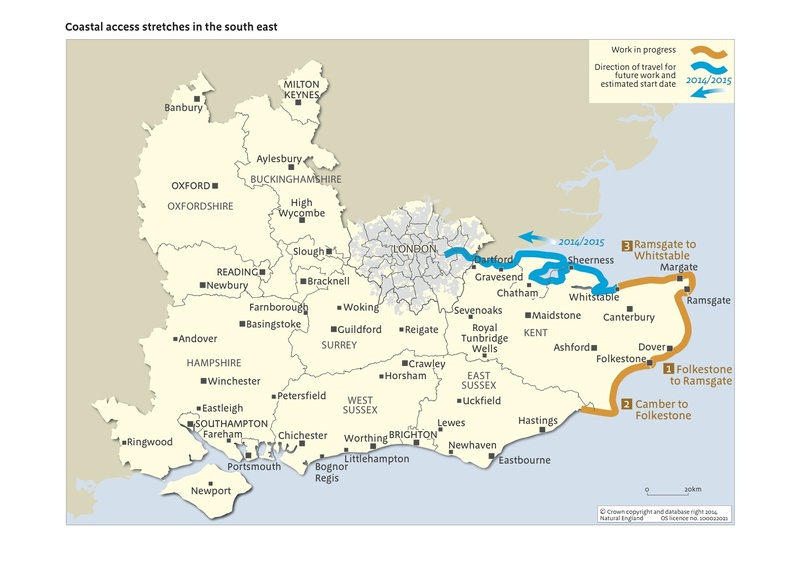 Preparation has already started to improve coastal access along a 40 km stretch of the Kent coast between Ramsgate and Whitstable and the stretch of coastline west of Whitstable in our application is scheduled to be mapped at the end of this year. The WBC will be following the mapping process closely, particularly in relation to possible objections by landowners, in this case the Whitstable Oyster Fishery Company. To this end we have already met with Natural England to discuss the new powers under the Act to extend recreational access to the English coast and enable the creation of a continuous access route around the English coast. We intend now to participate in the forthcoming consultation about the coastal route designated for Whitstable, and to wait and see if it addresses the concerns we had in respect of providing rights of access for walkers to the coast at Whitstable, much of which is in private hands. Although we believe that our application still has validity we now intend to wait to see whether the mapping of the coastal footpath by Natural England achieves comparable public access both to the beach and an appropriate route along the beach and sea walls. We do however reserve our right if not satisfied that our concerns for public access along the length of the beach are met within the framework of the Marine and Coastal Access Act to undertake further research and present more evidence of use, and also to make an application that the historic evidence of the Beach Road is more systematically investigated by the Kent County Council.